Click the button below to add the 2017 Reynolds 27.5 Plus Wheelset to your wish list. The Plus world is plush and friendly. If you’re looking for grip, float, and protection, and have 27.5” Plus clearance and Boost hubs, the Reynolds BLACKLABEL 27.5 Plus Wheelset will elevate your riding. It’s got all that, plus a super-model weight of 1625g for the set. The combination of Plus and Boost standards are making seismic waves in the mtb world. 27.5+ or 27+, is a big new standard. It takes the diameter of a 27.5 or 650b rim, and widens the rim bed to 45mm. Then is paired to an extra-wide tire. Think about this: a plus wheel with a 3.0” tire has the same exterior diameter of a 29er wheel with a 2.3” tire. It therefore rolls over stuff just as well, but the extra air volume increases comfort, grip, float all at once. You can drop the tire pressure down below 10psi and still have confidence that the rim is protected, while you reap the benefits of amazing traction. At the heart of 27+ wheels are Boost standard hubs. In back, this is a 148x12mm thru-axle. The extra width at the hub flanges (3mm each side) means a stronger wheel and the extra width at the hub means better tire clearance at the bottom bracket. Q-factor is the same. Up front, a wider 110x15mm thru-axle is used. Here, too, the extra width (5mm each side) strengthens the wheel and the wider fork is laterally stiffer. 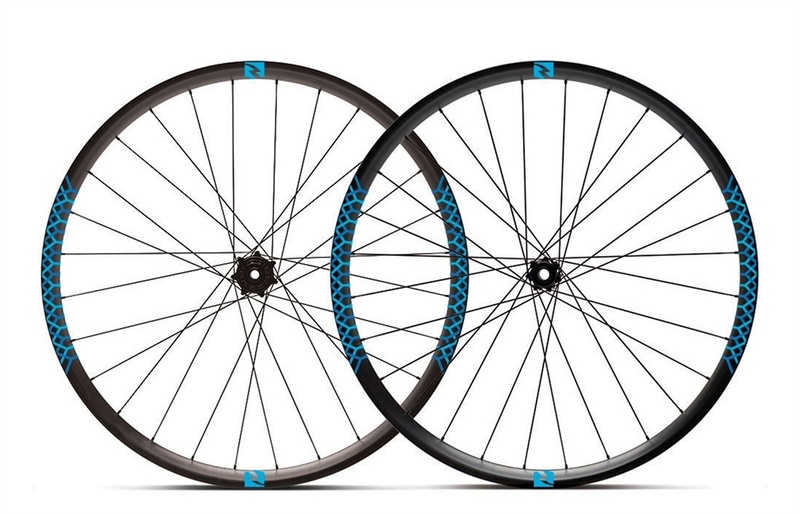 The Plus wheelset features the only non-asymmetric rim in the Reynolds mtb lineup. The extra width at the flanges means they didn’t need to offset the spoke bed to maintain strength. The rim itself is 24mm deep, features a 40mm wide inside channel and total rim width is 45mm. The inside wall is hookless and shallow and holds tubeless tires firm. The hubs are a joint project between Reynolds and Industry Nine. The hubs are produced by I-9 and the internals are identical to the Torch hubs, but the shell is unique to Reynolds, with straight-pull flange widths and heights tuned to mesh perfectly with Reynolds rims. The hubs come as 12mm thru-axle designs, 110mm in front, 148mm in rear. Likewise, the cassette is a standard 10/11-speed Shimano/SRAM-compatible spline body. However, an SRAM XD Driver body can be purchased separately and installed at home. The rotor mounting method is Centerlock. The wheels come tubeless-ready with tubeless tape and valves. And going tubeless can save you quite a bit of rotating weight, enough to really impact climbing. Your new Reynolds BLACKLABEL wheels can be covered by the Reynolds Assurance Program or RAP. If you’re the original owner of the wheels and purchase a plan from the reynoldscycling.com website within 30 days of buying the wheels, you are giving yourself a ‘no questions asked’ repair or replacement policy. They’ve expanded the program to give you the choice of purchasing one, two, or three years of enrollment. The program covers two wheel incidents per policy. The Reynolds BLACKLABEL 27.5 Plus Wheelset makes fat-ish bikes faster.